Paul is traveling for several months in Peru and Bolivia this fall searching for list songs. Check out his new album, King of Delusion. The album features Americana rock songs with lush extended guitar and horn solos. Composed by Benoit, the music features Rebecca Young and Bob Heinemann on bass, Dan Weber and Will Dowd on drums, Ron Weinstein on organ and piano, Damien Aitken on saxophone, Lucky Brown on trumpet and Grace Park (from Austin band, The Deer) on backing vocals. 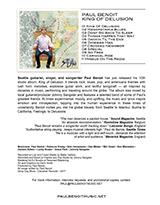 Thanks for your interest in Paul's music, you can find some of his albums here: ReverbNation, iTunes, CD Baby, Bandcamp, and Amazon.